The other night, Jeremy met me in my dreams. It was lovely. I finally got to see him again, it's been awhile that I've had a full dream about him - he pops in my dreams here and there, but mostly just to remind me he's still watching over me. This time, he was present, talking to me, sitting with me, and even put his arm around me. I've only had one other dream of Jer where I've been able to touch him, and it was a simple hug...he's always been out of reach to me. This time, sitting next to him on a chair, I curled into his shoulder and he put his arm around me. I remember stopping briefly to listen to his heart beat, even though I knew in the dream he wouldn't be staying. The dread of knowing he wouldn't come back made me concerned, and I turned to him and asked him what he thought about me dating Steve. (I'm not sure why I asked him this, because I have talked to him SO much about it, and have felt his blessing every step of the way) He smiled at me and in an almost teasing tone and big grin he said "What do I think about it?!" His smile turned warm, his eyes got serious and he said very slowly "Honey, I am sooo happy for you." And then I woke up. It has taken me two days to type that out. I am sitting here in a puddle of tears just reliving it, and I have been every time I think about it. I woke up with peace, but also with sorrow. It's weird to feel released to let someone else in my heart while loving Jeremy completely still. I didn't think it was possible to have a heart big enough for both. But while I smiled knowing how genuine Jer was in his happiness for me, it was like another realization that he's never coming back. It will never be him again. Bittersweet is a word I always use when describing my life lately, but I can't come up with anything else to better articulate it. I think about how much Jer has taught me about love. I remember thinking for a split second when I woke up that I wasn't sure I could be that selfless. That somewhere deep down, I wouldn't want to see him love someone else. But when I realize that he sees so much more of the big picture that I can't possibly comprehend, or when I think about him suffering even an ounce of the grief I've faced, I know it's not true. I would feel the same way. I would want him to find as much happiness as possible. Throughout the course of dreams I've had about Jeremy, I feel like I've watched him grow. I watched him turn into what God intended him to be. He seems wiser, softer, and more peaceful. I know that sounds weird, but I feel it - like I'm seeing him in real time. And I love that he always gives me an opportunity to remind him of how much I love him. It's so significant to me. I can't wait to really tell him, someday, face to face. Honey, I hope you can feel how much it meant to me to see you, even for a second. I hold onto those small moments as invaluable treasures that I will never forget. Thank you for bringing me peace and comfort, and for never letting me forget that you're with me every step of the way. I miss you so very much. I love you always and forever. Please keep voting!!! Only 7 days left, and the race is SO CLOSE! EVERY VOTE COUNTS and it only takes one click! Thank you for all your support!!! in the shelter of each other, we will live. 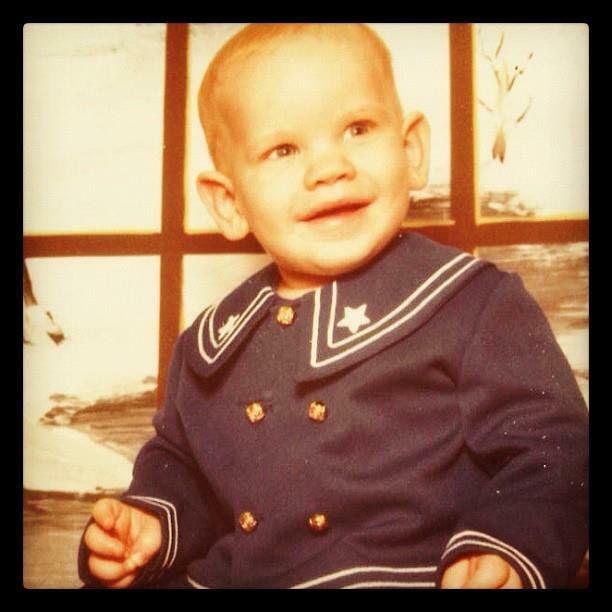 Today, Jeremy would have been 33 years old. It's weird, I remember posting last year on Jer's birthday, but I remember nothing about the day itself. I remember the feeling leading up to it, and I remember the party we had to celebrate Jeremy a few days after, but I don't remember the day. Instead I remember with dread the last birthday Jer had. I had a snow day from school and he got stuck plowing all day at work. The irony was frustrating and all he wanted to do was come home and spend time as a family. Today was an unexpectedly emotional day. I don't know why it came as a shock. I guess cause things have been going ok and I've been keeping myself busy planning his party again this year, traveling, and filling the days with other things, it didn't really hit me until last night. UGH. It really happens that way, like a punch to the gut. I was sitting at the kitchen table and realized 'oh gosh, tomorrow is Jer's birthday'. Of course I knew, but then I KNEW. He's not here. I don't get to celebrate with him. I don't get to wake up next to him and say Happy Birthday in his ear before he opens his eyes. I don't get to tell the kids to jump in bed with him and give him birthday kisses. I don't get to shower love on him and make him feel special on his day. I don't get to make fun of him for being an old guy. 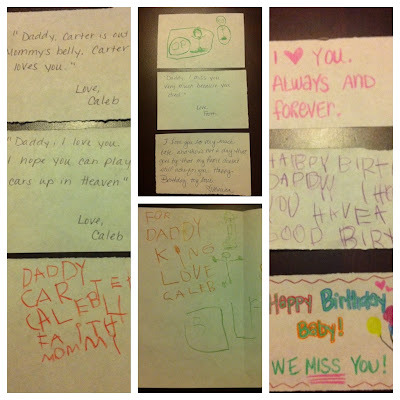 So, the kids and I decided to sit down and make birthday cards for daddy to take to his memorial stone at Rochester College (since we're too far away from his grave). I have been avoiding putting things there because it's on campus, but it was a special way to celebrate their daddy and show him how much we love him. We made cards and wrote letters on small note cards that we could attach to a balloon and send up to Heaven for Daddy to read. I asked the kids what they wanted to say to Daddy or tell him on his birthday and these are some of the things we came up with. "Daddy, Carter is out of Mommy's belly." "I hope you can play cars in Heaven." "I miss you very much because you died." They're so sweet and honest and pure. But when I woke up this morning thinking that maybe the anticipation of the day would be worse than the day, I soon discovered I was wrong. Today was hard. I cried looking at my kids. I cried realizing that I get no more birthdays with Jeremy. 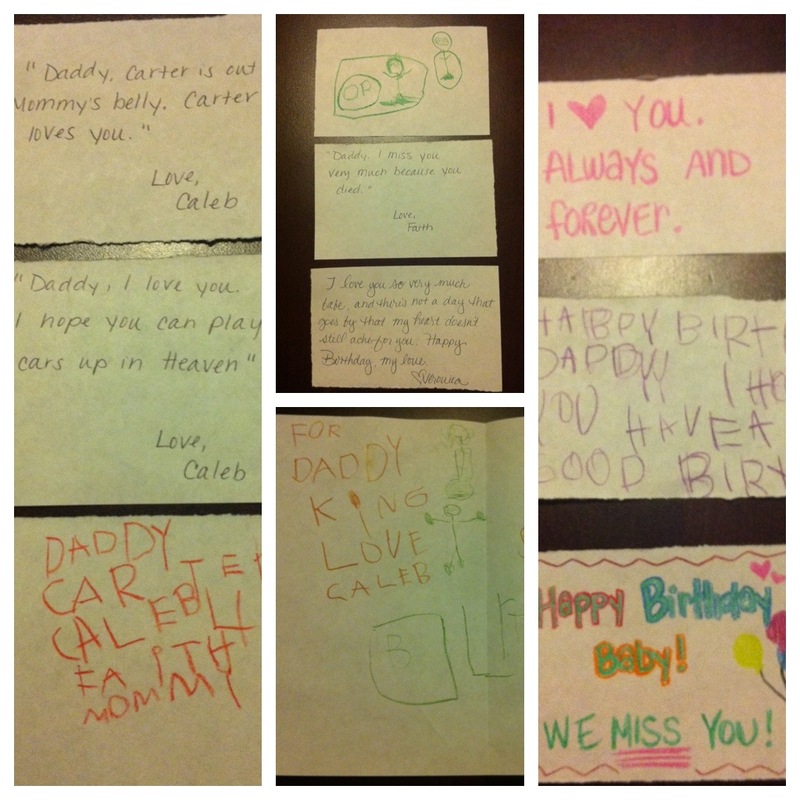 I cried talking with friends and hearing Caleb tell me over and over today "I miss daddy." 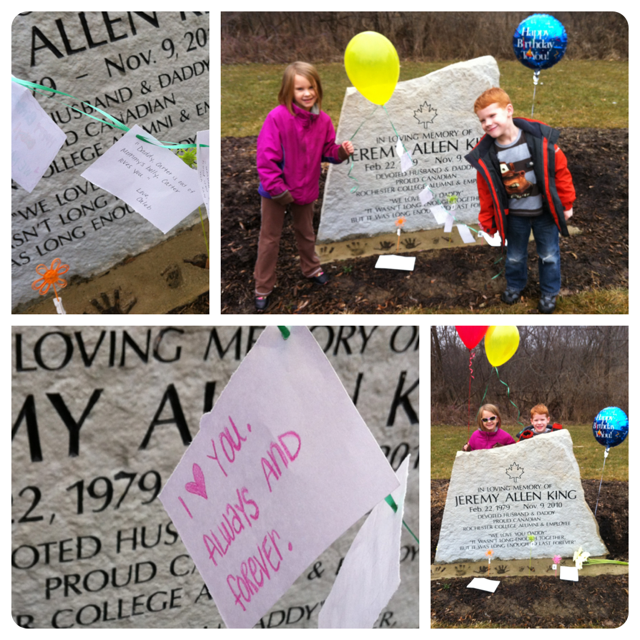 I completely lost it when we let go of Jeremy's balloons together at his stone while our kids chanted "we love you and miss you, hope you like our letters." I cried singing at church tonight. And I cried when we got news that a young mom in our congregation died today leaving her husband and 6 year old daughter behind. I cried for their family, for their little girl. And I cried remembering that place. When I sat there trying to figure out how I had survived the last 16 months without Jeremy, and trying to wrap my head around all that's happened, some lyrics stirred my soul: "In the shelter of each other, we will live. "My strength has come from others. Friends, family, acquaintances, and even strangers. 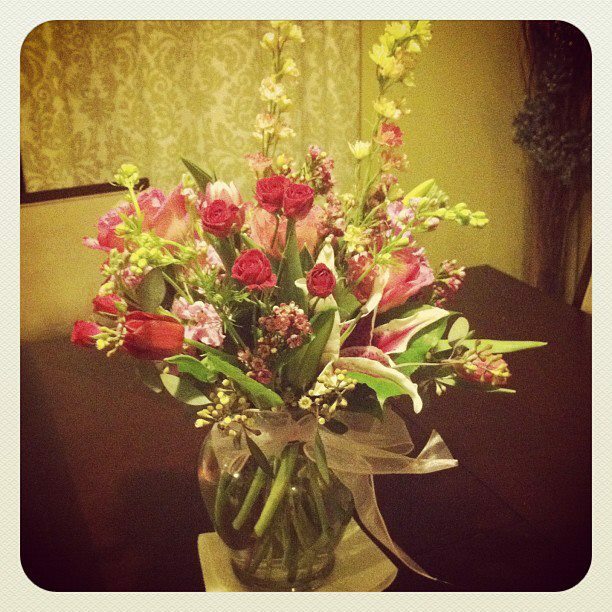 Prayers, phone calls, texts, FB postings, flowers, and the love of a really great guy has picked me back up today. Just knowing that people are reading my heart and my story means something. I have lived in the shelter of others, and it has pulled me out the depths of darkness. Thank you for being my shelter. Happy Birthday baby. I woke up wondering what you'd be doing in Heaven today. And right along with the kids, I felt excitement watching our letters float up in the sky to you today, with their child-like faith that you'd get to read them today. I know you did. I hope you felt my heart beating for you today, missing you with such sharpness. I smiled for your life well lived. I laughed at our memories. But I also still just desperately miss you. And watching the kids miss you is even harder to take. I can't wait for your birthday party tomorrow, to get a chance to once again, celebrate you. You are worthy of a grand celebration, and I know you're getting one in Heaven today. Thanks for all the support! 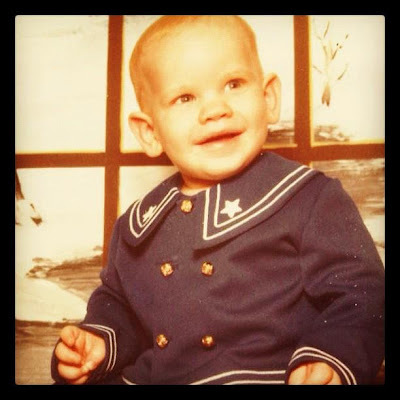 Keep voting and help me continue to make a difference with this silly little blog. Just one click is all it takes, and you can do it once a day. Thanks! 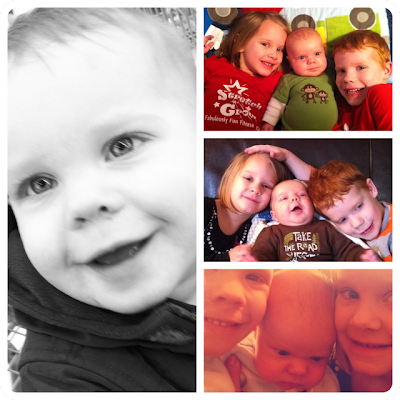 I've been nominated as one of the Top 25 Moms with Inspiring families for 2012. 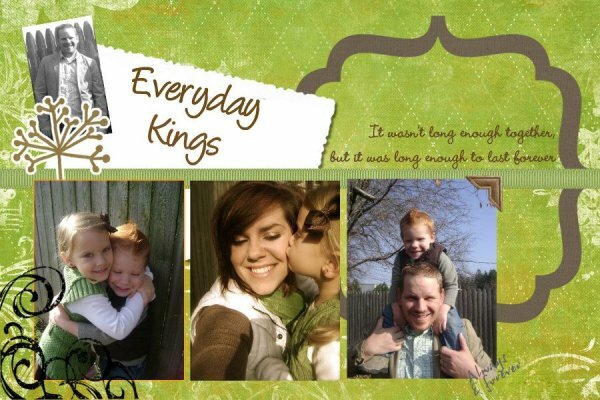 The contest is for moms whose blogs inspire other with their stories. I know I'm nothing special without my children and the people who love me, but it's my prayer that my story continues to reach others and make a difference. And to remember my love. I'd love your vote! "Happy Valentine's to all of those who feel like they are missing love, for those who are grieving love, and for those who are still searching for love. May God's unending love for you this day bring you comfort and peace." I went back and read the Valentine post I wrote last year. Wow. What a completely different place I was in, and my heart was in such turmoil. It brought me back to those emotions and how raw they were...I was so bitter and broken. And again today, I felt a lot of sadness for not being able to share my Valentine's Day with Jeremy. I felt stuck in a place where I am happy to look forward to a future and thankful that I've found another Valentine that I am grateful to celebrate with, and yet feel an ache for the only other Valentine I've ever known. I haven't forgotten. But that ache has reminded me that there are so many people who need to feel loved. Not in a mushy, lovey-dovey way, but just knowing that someone cares. That's what this day is really about, right? Today, I am reminded of God's love and mercy towards me in my life over the last 15 months. It has filled me today. I had a lovely Valentine celebration yesterday with my sweet date. He is very romantic and always treats me like a princess! But really it was just another reminder for me to love with everything I've got. And it has been my prayer, even long before I wanted to accept it, that others would be moved by my story to do the same. Happy Valentines Day. May you love and be loved today. I knew today was coming, but now that it's here, I'm in complete shock. 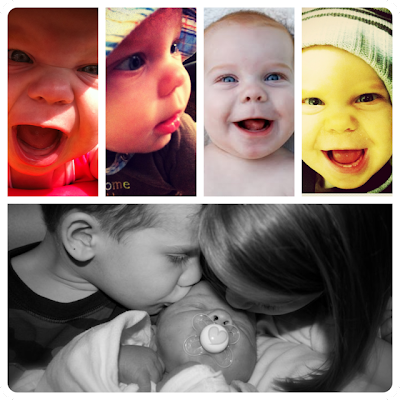 I can't believe my baby boy is 1 today. Even more, I can't believe what that year actually represents. It means we've survived, it means we're still here. It means Carter is healthy, happy, and beautiful. He didn't just survived, he thrived. The days of resentment I had for having to raise this guy all alone are long gone. I hate that Carter will never know his daddy and I will never get to share his life with Jer, but I see what a blessing he is to me. I see how he has saved my life. However, it's still emotional for me. Today still hurts. 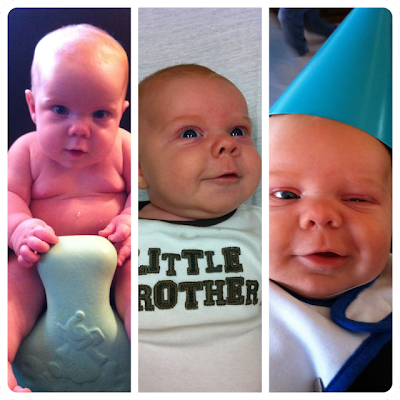 Thinking about last year is very painful, I wish Carter had come into this world in such a different way. But today, what matters, is that we made it. Happy Birthday, my sweet angel. We've come a long way. Oh, honey....how I miss you today. 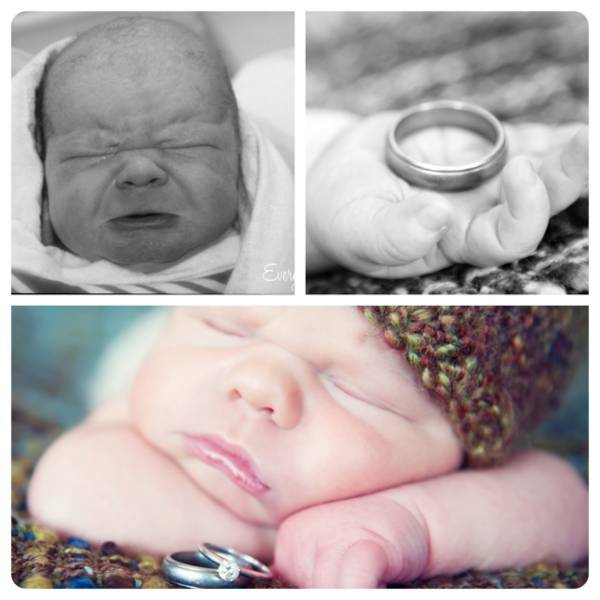 How I wish I could share this day with you, to celebrate the life of our beautiful baby boy. In some ways, I wish you here to celebrate for Carter, to see him, hold him, and feel what happens in your heart when that boy smiles at you and to let him know your presence in his life. But some parts of me wish you could celebrate with me the fact that we survived his entire first year of life without you. I would have never believed it, and just look at him: He's crawling everywhere, he can say 'mama,' 'dada,' 'uh oh,' 'papa,' 'what,' 'sissy,' and can wave, blow kisses, wink, give hugs and sweet slobbery kisses...he's so close to walking. He's got a red-headed temper just like Caleb, and he's got your stubbornness. He's absolutely beautiful and I know you would be smothering him with love today. It's hard to think back to this day last year and not tear up...it was literally the scariest day of my life. That moment of panic I experience when the doctors laid me on the table still makes me cry and shake when I think about it. No one should ever have to go through that moment. 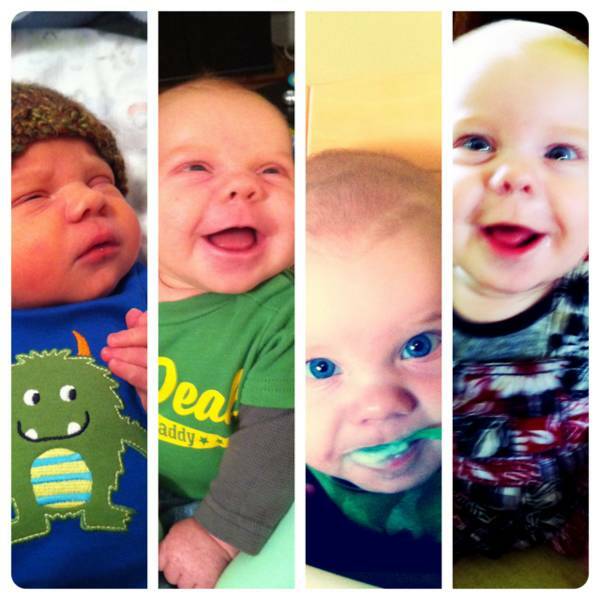 But I realize what a gift Carter is to me. My gift from you. I may never understand why I had to experience having your child without you, but I can tell you that he has saved my life. He brought me joy when I couldn't find any. He breathed life into me when I had none. He forced me to look outside myself and my own grief in order to protect him and take care of him. And in a way, he allowed more people to see who you were and our story. He doesn't know it, but he has already changed lives. I remember making big plans with you for our little guy, but I know God has something magnificent planned for his life. I see that God created Carter for Him, not for us. I see such purpose in his life. I know you're smiling big today babe....I would give anything to see it. I miss you always. I love you forever. "What screws us up most in life is the picture in our head of how it's supposed to be." It's been such an emotional week for me. Everything makes me cry at the drop of a hat, and everything makes me miss Jeremy. And as quite a contrast, I've been blessed with some really good things, good friends, and very thankful to be in a relationship that is accepting of those times for me and in turn has helped me heal in so many ways. It reminds me of a session I had back in the summer where my grief counselor had painted a picture of life after grief. She described a railroad track, one side of the track representing grief and pain, and the other side of the track represent joy and happiness. They run side by side, constantly and you can experience them both simultaneously. I will say that it is very draining. I have felt so tired the last few days, just wanting to sleep away the stress, not wanting to think about anything, and just fast forward a few months where a new transition in my life wasn't so complicated anymore. I know it will get there, but patience is not my strong suit. I've had this idea in my head that I've never spoken out. I've carried this burden that because I was closest to Jeremy, I should grieve the hardest and the longest. I think I've got hardest covered: to rock back and forth on your knees, screaming, dry-heaving, because the pain of reality is so consuming it physically takes over your body is a dark place I will NEVER forget. I've never been so scared in all my life. And I know I will grieve Jeremy the rest of my life. Just knowing that all the pain that still goes on in my life right now, all the struggling through transitions, all this trying to find my place comes back to the fact that Jeremy is dead and is not here anymore is a sickening reality to face. But there was this perception that I need to hold on to that dark place because I loved him so much. It's the root of my guilt to wanting to find happiness again...that other people might have the same perception and somehow doubt my love for Jer. I know 15 months out doesn't seem that long to some to start dating. But when you lay in bed alone every single night without your husband, it feels like an eternity. I've asked Steve a lot about being a grief counselor and the things he sees on a regular basis....and I am always shocked when he tells me how many people get remarried within a few months of their spouse passing. But what it really comes down to is that the people closest to the deceased are the ones most secure in the relationship with them and know them the best. When you have felt great love and you lose it without consent, you crave that companionship cause you know what you're missing. I know where Jeremy and I stood in our relationship, and I have peace about that. I am still grieving a future that I will never get to have. I am still grieving the fact that I will never share certain things with Jeremy, or that our children will never get to experience him in their lives again. That will never cease to cause me pain. I realized that maybe I've ignored that fact that tomorrow Carter will be one (holy crap, I can't believe it), and in a few weeks will be Jeremy's birthday, then my nephew's birthday, then Faith's birthday...all in a row. My body and my heart anticipate these hard days before my brain ever realizes it. Today, I couldn't believe how far I've come since last year but I also see that I still have a long way to go. Sometimes, I would really like a break from all this emotional turmoil, knowing that it will follow me around, in one form or another, forever.